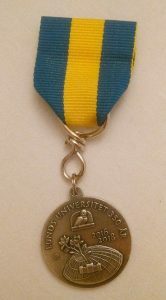 So as you most probably know already, Lund University is celebrating 350 years and a lot of events and activities have been happening for the past year and much more is still planned! A few days ago, there was a big celebration party at Lundagård for the whole staff and students for the jubilee. I and some of my friends went and enjoyed it a lot! During the day we went to a picnic organized by LTH where you got a picnic bag and blankets and met with some new people in front of the Lake Lake. It was really fun (except for the rain surprise at some point). Later, in the evening there was the celebration party in front of the University building with live music, lights and lot of people. We also got a lovely present at the entrance, which I think is a very good souvenir to keep for being part of this 350 years celebration. It was great! This entry was posted in Around campus, Student life and tagged Faculty of Engineering LTH, Lund University, Lund University, Student life. Bookmark the permalink.